Years ago we saw an outstanding display at a Carnival Glass Convention that contained two Fenton stretch glass shaving mugs. One was in topaz and the other was in celeste blue. Willie Addis was the owner of the mugs. One day years later, we received a note from Willie saying that he was thinking about selling one of his stretch glass shaving mugs; think it was the topaz one. YES, YES, we wanted to get it. Sent him a check; couldn’t wait for the post office to deliver the mug. It was wonderful when it arrived! Waited a couple of months and then contacted Willie to see if he might part with the other mug which was celeste blue. Yes was his answer. We were so happy to have the shaving mugs. At that time we were the only stretch glass collectors to have the pair of shaving mugs. 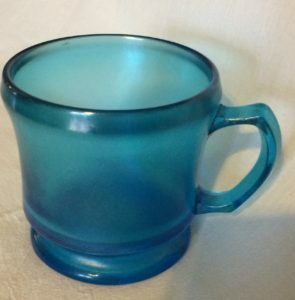 Within the next several years, stretch glass collectors found the mugs on EBay, antique shops, thrift shops. Not really sure, but would guess that there are around seven to eight sets known. 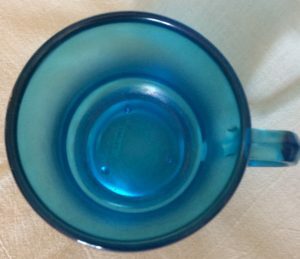 All of the Fenton Shaving Mugs #630 have been in the topaz and celeste blue colors. Has anyone seen the shaving mugs in any other iridescent colors? 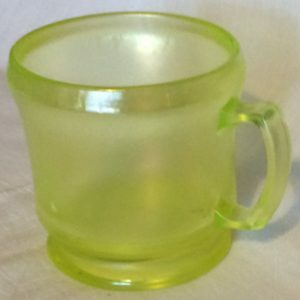 Also we haven’t heard of any showing up recently; have any of you found any stretch glass shaving mugs recently? All of the carnival glass shaving mugs are larger than the regular carnival glass mugs. The Fenton shaving mugs all have three small raised dimples inside the mug to hold the soap off of the bottom of the mug. That is so the soap doesn’t go all mushy in the bottom of the mug. Just like the soap that you use at home. 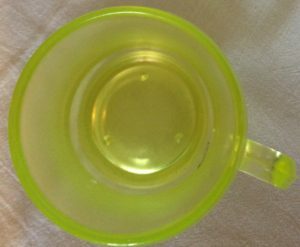 None of the carnival glass shaving mugs have a way to keep the soap off the bottom of the mugs. The area that looks like a black scratch on the side of the topaz mug is where someone tried to use the mug with a shaving brush. Russell’s parents nor my parents cared much for the “junk” that we brought home. So when Russell’s father saw the shaving mugs, he had a ‘glint in his eyes” that I had never seen before. Wasn’t sure if he was going to have us committed or he liked the mugs. Surprise, Surprise!!! He went home and came back beaming with the shaving mug that his father had given him in the thirties when he became a man! His father was a barber and not rich in the thirties (nor at any other time). 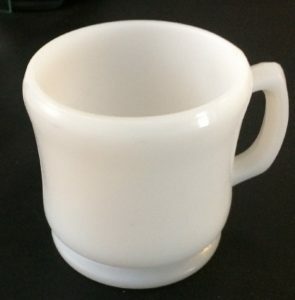 Ray’s mug (which he used for many years along with a straight razor), is a Fenton milk glass (non iridized) mug from the thirties with the three dimples in the bottom to hold his soap. The sides have a number of brush black marks. 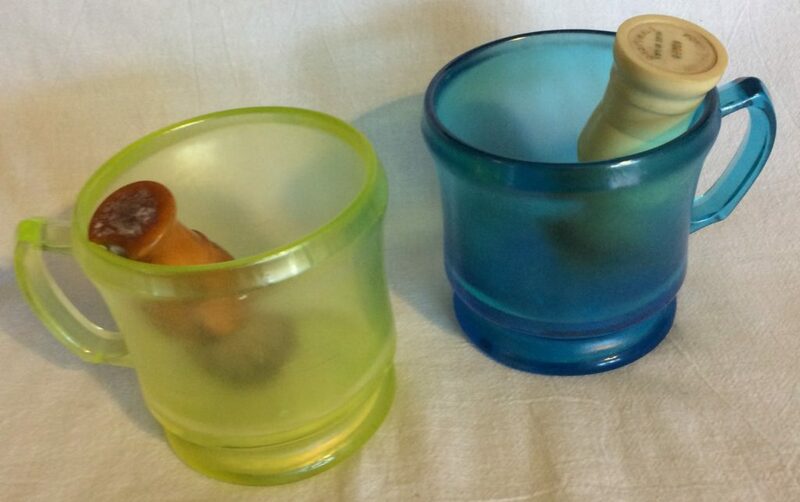 We would very much like your feedback, if you have either or both of the Fenton Stretch Glass Shaving Mugs? Or if you might have any in any other iridescent stretch glass colors?